In the 1700s Atwood proposed a type of machine, now called Atwood's Machine, in which two weights hung over a pulley to partially counterbalance each other. It is then possible to do useful things relatively easily. This type of concept is used in elevators, and in the lift lock on the Trent River System in Peterborough, for example. 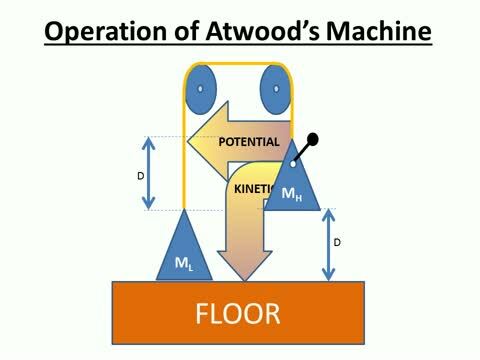 In 1955 HT Odum, working with physicist Pinkerton, published a paper in which Atwood's Machine was analysed, among other systems, to demonstrate the maximum power principle. (H.T.Odum and R.C.Pinkerton (1955) 'Time's speed regulator: The optimum efficiency for maximum output in physical and biological systems ', Am. Sci., 43 pp. 331–343). The curve above and to the right, sometimes called Odum's 'humpbacked curve', shows that the efficiency of Atwood's Machine is at 50% when the power is at its maximum. This brief video shows how the AM works. We start with all of the gravitational potential energy stored in the heavier mass held a distance D off of the floor or base. When the release pin is pulled, the potential energy splits into to streams. One stream of potential energy is simply transferred to the lighter mass. The other stream is turned into kinetic energy as the coupled assembly of masses accelerates. If friction is neglected, the action is all reversible until the heavy mass hits the floor, at which point the kinetic energy is transformed into waste heat. The energy in the lighter mass is "Still Useful" when the action is done. In this note I reproduce the equations for Odum's 'humpbacked curve', and compare that curve to my 'E-curve' developed in my study of Entropy in ABMs. In the accompanying spreadsheet I generate a variety of graphs used in the note. This is my recreation of Odum's humpbacked curve, as per the spreadsheet downloadable above. This is my E-curve discovered while doing a study of entropy in ABMs. When I saw the similarity between these two curves, one discovered while studying the implications of the Maximum Entropy Production Principle (or MEPP), and the other discovered while studying the implications of the Maximum Power Principle (MPP), I was convinced, at first glance, that they were the same curve. Sadly, when normalized and scaled, they are not. The E-curve is symmetric, while the humpbacked curve is not. I nevertheless remain convinced that both of these laws, each proposed as the "Fourth Law of Thermodynamics" by two different constituencies of scientists, are two sides of the same phenomenon. In this note to file (a diary note) I examine the peculiar shape of Odum's humpbacked curve more closely. It is, truly, an odd curve. There it is, most of it, at least. When written as P a function of E, you discover that P(E) is well-defined on the interval (-1, 1]. At x=-1 it is asymptotic to the vertical line there, rising to infinity. I struggle to find some meaning in the concept of negative efficiency, but fail. Perhaps someone smarter than me can come up with an idea. On the interval that interested Odum and Pinkerton, i.e. on the interval [0, 1] you can see some of the asymmetry mentioned above. Very close to zero, the curve is linear, on both sides of zero. But, very close to one, it appears to drop off sharply. I zoomed in on both spots, getting the graphs below. On an interval very close to E = 0.0 the humpbacked curve is linear with an R squared value of 1. Wow! On an interval very close to E = 1.0 the humpbacked curve is a power curve, again with an R squared value of 1 (not shown, but in the associated spreadsheet). This is Part I of a pair of notes in which I hope to get to the bottom of the mystery that is the (Maximum Power Principle) MPP. In this note I think through the issues of energy degradation and entropy production in the AM as a closed energy system. Then I convert the AM to an open system, of sorts, and speculate on how it might function in a wider environment. I call an open AM of this sort an OAM. This leads me to a concept of a linkable array of half OAMs, functioning at efficiency E = 50%, and functioning as energy store and forward mechanisms. I speculate on how such a linkable array might be subject to evolutionary selection principles, and, I think, this finally sets me up to ask the big questions. What exactly is the MPP about? I start working on Part II of this NTF today (i.e. 150114). A linkable array of four half-OAMs, each able to join with a neighbour in the array and function at efficiency of E = 50%. Such a mechanism, I believe, would enable storage and transport of high-grade energy from point of capture to point of 'use'. The above NTF has a number of references to my other diary notes that may be of interest. They are scattered elsewhere on my site, or elsewhere, so I provide links here to make it easy to find and download them: If there is no link here, I have not uploaded it. Cockshott, Cottrell, Michaelson, Wright and Yakovenko, Classical Econophysics, Routledge Advances in Experimental and Computable Economics, Routledge, Taylor and Francis Group, London and New York, 2009. 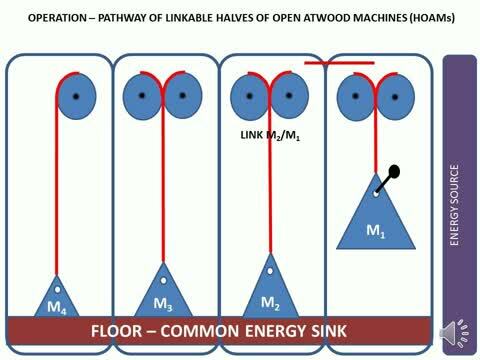 This video demonstrates the "thought experiment" in which a chain of Half Open Atwood Machines (HOAMs) would function. The first HOAM is primed by the source. Then it links with the next HOAM and some energy it transferred, while some is used up in the transfer. Couplings and decouplings continue down the chain until a portion of the original energy is delivered to the final link in the chain. At that point, the final link consumes all of the remaining energy. In the video the process repeats three times. After thinking through the implications of the Lotka/Odum MPP, I have come to believe that this provides a template for all persistent energy pathways in self-organizing complex adaptive systems. In OamLab, a population of linkable half OAMs exist in chains. They are in a Darwinian competition for survival, and may the most fit win. This is testing the ideas first put forward by Lotka in 1922, and further developed by HT Odum in 1955, and by many others. Step 1 - Download OamLab using the link above and put it into a directory within your 'My Documents' folder. Step 2 - Download and install NetLogo using the second link above. Step 3 - Go to the directory in which you placed OamLab and double-click the .nlogo file. Step 4 - When the "Main Panel" appears, shown above, click on the "info" tab and read it. Step 5 - Go back to the 'interface' tab, click on 'Setup', then click on 'Go'. There 36 different ways to configure the paramters of OamLab, giving me 36 different scenarios to look into. The following graphics have been taken from a scenario with the following characteristics. The Darwinian fitness test is a joint test that trades off rapidity of reproductive process (total for all OAMs in the chain to drop their loads) against effectiveness of energy transfer to offspring (high efficiency, as defined by Odum). In addition, all chains have been initiated with low efficiency ratings throughout the chain. The carrying capacity of this environment is 30 chains, and all chains are 14 HOAMs long. These graphics were taken after 7,721 ticks, or about 90 generations of chains. On the left you see the thirty chains of Halves of Open Atwood Machines (HOAMs). Each chain has a smiley face at its head. Two side-by-side HOAMs can couple to form an OAM as the mass on the right falls, transferring usable energy to the left mass. Energy travels as a pulse through the chain from head to tail. The two yellow HAOMs are currently coupled as energy is being transferred. It's like a horse race. The first to get to the tail of the chain (on the left) gets to replicate by fission, and one daughter chain gets to displace the least fit of the other chains. For the first five generations of chains the environment is not yet at carrying capacity, and there is no Darwinian competition. Random genetic drift dominates any changes, but processing capacity rockets upwards. But, the Maximum Power Principle predicts that, under such conditions, the efficiencies of all components of the process will evolve towards a middle efficiency. Low efficiency means overly large right-hand masses, and short times for the right-hand masses to fall. As the population of chains evolves, you would expect the small masses in the tails to get larger, the large masses in the heads to get smaller, and the time-to-drop for the whole chain to get longer. They do, they do, and it does! (Not shown.) The horses in this race tend to synchronize their starts. With each generation, as the head HOAMs slam down on the floor, a blast of kinetic energy is released, forming a red spike in the above curve. The usable energy, on the other hand, smoothly moves from the right to the left, as shown by the green curve. If a chain has 14 HOAMs, it can form, each in turn, 13 OAMs, numbered from 0 to 12. Consider a 'class of OAMs' as all those in the same position. So, there are 13 classes of OAMs, each class having 30 members - one per chain. 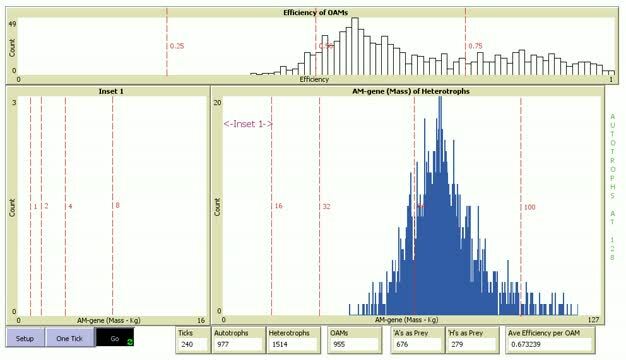 I can average the efficiency of each class of OAMs and plot, as per the graphic to the right. These have not yet converged on a middle efficiency. That is yet a long way away - many hundreds of generations of chains in the future. - If Odum's explanation of the MPP is correct, you can view these chains as pathways for energy to be captured, transferred through the levels of a trophic web, and ultimately put back into the environment. As species evolve (i.e. as HOAMs mutate and evolve), so do the chains, and so does the web of connections between species. So not just the evolution of the species is controlled by Darwinian processes of natural selection, but the evolution of the entire ecosystem is subject to Darwinian-style evolution. - OR, you can view the chains as 'metabolic pathways' by which needed metabolites are produced in cells. As critical components travel from molecule to molecule, the reactions occur in serial order, until the load is delivered to the tail. Those metabolic pathways start as inefficient modes of resource collection and transfer, but the more fit pathways (those that produce sufficiently constituted and energized metabolites in a sufficiently short time) lead to more successful organisms that cause those pathways to become more common in that species. And so, the species evolves. - Or, you can view the chains as pathways in an economy through which energy, or natural resources flow. Those pathways that keep people sufficiently healthy, wealthy and energized lead to more successful social systems. And so, societies and economies evolve. I think I am starting to understand the argument! I am finally prepared to release (as of 1 April 2015) my MppLab I model. [ No, this is not an April Fool joke.] Again, this is a model written in NetLogo 5.0.5, and can be run using the same software as the OamLab model. There is no user documentation or design documentation, other than what is in the "Info" tab of the model, or listed here. In MppLab, a population of linkable half OAMs exist as free organisms. They are in a Darwinian competition for survival, and may the most fit win. This is testing the ideas first put forward by Lotka in 1922, and further developed by HT Odum in 1955, and by many others. Step 1 - Download MppLab using the link above and put it into a directory within your 'My Documents' folder. Step 3 - Go to the directory in which you placed MppLab and double-click the .nlogo file. Other than the "Info" tab of the application, this is the closest I have to user documentation. It is a description of the user interface for version 1.04. It is a little out of date, but still, I think, informative. This is the change diary that I maintained as I developed this model. It may provide some insight that is not available through the other documents. This is a first attempt for me to learn about Odum's ESL diagrams. I have used them to model the trophic levels that evolve when the "Omnivores" scenario is run. Check out this super cool video produced using this model (November 2015). For a detailed explanation of the graphs, the monitor windows along the bottom, and the action, see my page on the MPP and MEPP. The key monitor window is at the bottom right. This number which starts at 0.78 should converge over time to 0.5.